The Enterprise crew attempts to exterminate a plague of amoeba-like creatures from possessing human hosts at a federation colony. The crew must stop the creatures from spreading throughout the galaxy. This is the final episode of Season 1. "Operation: Annihilate!" 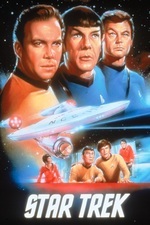 is the last original episode from the first season of the original American science fiction television series Star Trek. It is episode #29, production #29, and was broadcast April 13, 1967. It is written by Stephen W. Carabatsos, and directed by Herschel Daugherty. The monsters look like ketchup packets. I've thought this since I was about 12 and every time I see this episode, I can't help but think, "ARRRG, the ketchup!" This freaked me out as a kid but watching it last night in HiDef really showed how silly the monsters looked. They had the right idea though, some more mucus and more whipping tendrils and those things would be terrifying. It's an exciting and well paced episode up until the resolution. Spock's blindness and recovery is a total cop out and we never even hear what happened to the colonists or even Kirk's nephew. "Sorry about your parents, kid. We are going now, have fun as an orphan on a planet filled with tramatised survivors. Scotty, energise transporter"
Per the Memory Alpha link "A filmed scene cut from this episode featured dialog between Kirk and his nephew Peter. The dialog concerned Peter's returning to Deneva to live with Sam Kirk's partner. The scene was edited from the episode."